Well Happy New Year ladies! I hope you enjoyed and now everyone is back to their schedules right? And welcome back to the podcast – we are officially at double digits here for episode 10 and I’m so happy you are listening. Hopefully you are finding the tools helpful. And remember – you can always dm me with any questions on my Facebook or Instagram page – mindfulweighs coaching. Ok – let’s get this party started… Today I want to take a page out of my Master Coach instructors podcast format. Let me take a step back – The way I got started doing this was I think about 3 years ago when my friend Annette told me about a podcast called The Life Coach School with Brooke Castillo. Now, Brooke is my Master Coach Instructor, and every 10th episode she shares a teacher or mentor or someone who has influenced her. Its such fun to hear from her, so I want to do the same for you and share my “aha” moments. It’s Super fun to get different perspectives and ideas. Now You may think I would start with Brooke, but I’m actually going to save her because today I have a special opportunity to tell you about at the end of this podcast, and the timing is such that I need to get you the info in a timely manner. so lets dive in. How many of you are in the mindset of goals, and cleaning and organizing this time of year? I am one of those people that likes to clean out at the start of the year and organize. I have to tell you – I do it every year – lol.. in fact – I was telling someone last year I was decluttering and had a donation pile and she was like – it seems like you are always decluttering and have a donation pile. You know why – b/c I never REALLY did the cleaning out. This year is a little different. Here’s why. See – in the past I would clean, donate, and trash. But I really didn’t have a system or too much thought in it. I still kept a lot of things b/c I wasn’t sure what to do about them. But a couple months ago I signed up for a course – it was called the Closet Makeover – with Shira Gill – she is an organizing expert, and life coach. It changed everything. The funny thing is – I am So not a fashionista – but in doing the program you take your style into consideration as well – it was like a bonus for me..lol.. I’m still working on that but it opened up some new ideas. The reason I want to talk to you about Shira and her program is because I think it is so closely tied to what we do here when we talk about thinking in mindful weighs and drinking less with tools that are lasting rather than willpower. Ok – so the program Shira has is called the Virtual Closet Makeover, and actually she has been feaured in a number of magazines including Parents and Real Simple. The program was a closet makeover, but really so much more. We actually started with like a sock drawer and at first I was like really? A sock drawer? Loll But then you go to the closet.. If I’m being honest I was still kinda thinking – dude – I need more than a closet makeover I need like a home overhaul….lol.. but the process is what is so important. And that is what matters when you are doing this work to drink less. So often I talk to clients who want to stop over drinking and think it happens over night. Remember – the habit of your current drinking didn’t happen in one night – it has likely been some time, and it’s been a process. So too is reducing the desire for alcohol to begin drinking less. Remember to learn the process as we do this. Focus, and continue to take steps to show yourself you can do it. The reason I thought talking about Shira’s program made sense today was because it is the New Year and the key to success for any goal is how you work on organizing your mind in order to organize your life. Truly, this is the reason why I was able to organize at a deeper level this time – because I worked on cleaning out my mind as well. And you know what? When you can organize you just feel better right? You know what I mean – like when you make the bed, or get the dishes done – it just feels better. 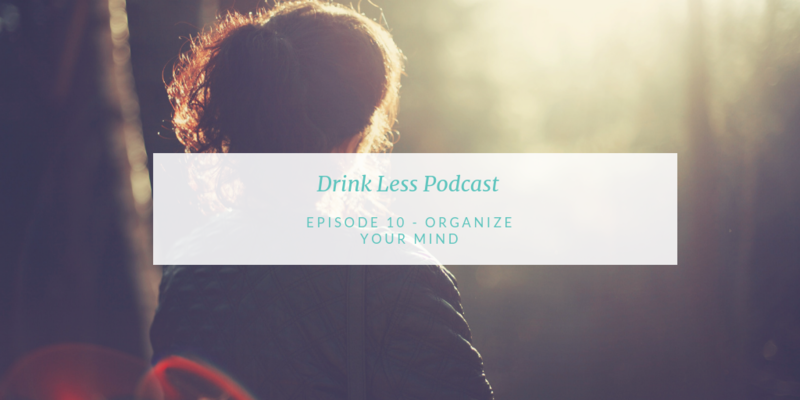 So let’s talk more about how this closet program relates to your thinking and drinking less. We have so many thoughts in a day. Did you know – they say on average we have about 70,000 thoughts per day – that’s a lot right? Many of those thoughts just run unconsciously. Like – brushing your teeth, walking – we don’t consciously have to tell ourselves – pick up your left leg, drop it, pick up your right leg, drop it. That is just delegated to the lower brain for efficiencies sake. These are just some thoughts that are so repetitive we don’t have to think about them. And that’s a good thing – because it keeps us moving right? Now, we also have thoughts that are conscious – we decide on purpose to think about how life will be in the future, for example. But we also have a number of unconscious thoughts that have been delegated to the lower brain that don’t really serve us. This work is about organizing all of them and creating a life you imagine by living on purpose and thinking deliberately. Well – if you’ve listened to any of the previous episodes you may guess the answer – becoming aware – always the first step. You may ask – if they are unconscious how do I do that? Good question.. actually – I think any question is a good question. The way you start figuring out what those are – just like any good spy … you begin eavesdropping. So – think about when you are cleaning out your closet. You take everything out right? Everything. With your brain it’s the same thing. Sit down and start writing everything that comes to your mind. Put it all on paper. Yes – the good, the bad, and the ugly. Don’t worry – lol .. this is not homework you will be turning in. Clean it all out – just like you get in the back of the closet and have to get those dust bunnies… empty it all on paper. It’s an interesting shift because now you are not just thinking – you are thinking about what you are thinking about. You can recognize that these are your thoughts. Sometimes when we get all up in our head we think it’s completely us – its not, it is our thoughts. Now..lol.. sometimes what you see may be frightening..lol.. But being able to see it allows you the space to see they are only thoughts. Observing your thoughts is the key. BTW – this activity is called a thought download. I like to have my clients do them daily – it really helps to keep you focused on mind management. Ok – now that we have them all out let’s start organizing them. Make a list of the Circumstances. Circumstances are facts – something everyone will agree on and could be held up in a court of law. Circumstances are always neutral. Like wine. Wine is neutral. It just sits there. It doesn’t always feel neutral because of the way we think about it, but trust me it is. This list for circumstances is typically pretty short. Everything else is usually thoughts – and they are all optional. This is sometimes challenging when just beginning b/c sometimes we have been thinking a thought for so long that it feels like a fact. I was actually looking back at some of my thought downloads from a couple years ago and I had thoughts in my circumstance line. So if you are doing this and have questions – feel free to reach out to me. Is it current, or outdated? Remember – you are asking about your thoughts – they are always optional. We are not changing any facts – or circumstances. You know why it’s so important to stick to these questions for the thoughts only? Because you are always in control of them. We don’t always have control over circumstances – so knowing we can change our results in life by changing our thoughts is so powerful. I want to give you an example. Let’s say you’ve been thinking “I can’t stop drinking” . This may feel like a fact – but it’s not – not everyone will agree – like my guess is you stop drinking when you are sleeping right? And I’m guessing you are not drinking while you are at work. So watch what your brain likes to tell you. Let’s play it out – you think “I can’t stop drinking”. My guess is thinking that makes you feel defeated. And then when it comes to your drink plan – you likely don’t take is seriously – or maybe if you were thinking that, you didn’t even develop a drink plan, and what is the result? You don’t cut back. So thinking you’ve never been able to cut back produces the result of not cutting back. Is it current or outdated? Sister – it is out dated. In order to become your next best version we want to get you to first recognize it is optional, and then lets find a clean new thought. Just like you get rid of that sweater that is pilling but you keep holding onto it because you’ve had it since college and it is comfortable ..lol… no more – time to get rid of the comfort in order to get to your goals. OK – so now – let’s go shopping for some new ideas. Try them on to see if you believe them – you must believe them or you will not take action on them. For some of my clients its as simple as – I’m learning new ways to drink less. Now, how do you feel – maybe curious? And if you are feeling curious you may actually start trying some of what I’m talking about here. And guess what – eventually you will learn new ways to cut back. But remember – please, please – I love that you listen here but if you want to get the results you have to start doing – not just listening. If you haven’t already gone to mindfulweighs.com/freebie head over to get the free download to start tonight. DOING is actually the true magic. When you download the guide you will also have a chance to sign up for one of my limited consult calls for free. I highly recommend if you want to really dive in and stop over drinking for good. It’s not like AA – its customized to you and I like to do this work with a flare of fun. I think so many people think they will lose out on fun if they drink less and that is not the case at all. So let’s do this – sign up today. OH – and b/c I love you all so much – I told you at the beginning I had an opportunity for you. I want to let you know – Shira’s program is open right now – so if you are interested I’m putting the link in the show notes – in fact she’s added a bunch of content since I took it as well – you can go to shiragill.com/closet-makeover. Registration closes Jan 8th. I don’t get anything for it but I just loved it so much and it made such a difference or me, so I want to share with you. Ok – that is what I have for you today. Let’s circle back next week. But for now – make it a great day – take care!